Donald Trump has thrown down the gauntlet to Britain and her European allies. The US president is warning that 800 jihadists from the UK, France and Germany must be dealt with in their home countries following the collapse of Islamic State as a territorial power. If not, they will be freed. As the last enclave of the fabled IS caliphate falls in Syria, ending a reign of terror involving beheadings, sexual slavery and other forms of medieval barbarity, our government is being asked by its most important ally just what it intends to do with British IS supporters – some of them battle-hardened terrorists – now languishing in captivity following their surrender to US and UK-backed Kurdish fighters. The Americans are right to demand action: British jihadis, including the so-called Beatles, have beheaded and otherwise butchered US citizens. Yet, clear answer from our Government comes there none. Confusion and dither are becoming the hallmarks of this administration, distracted as it is by the paralysing turmoil of Brexit. 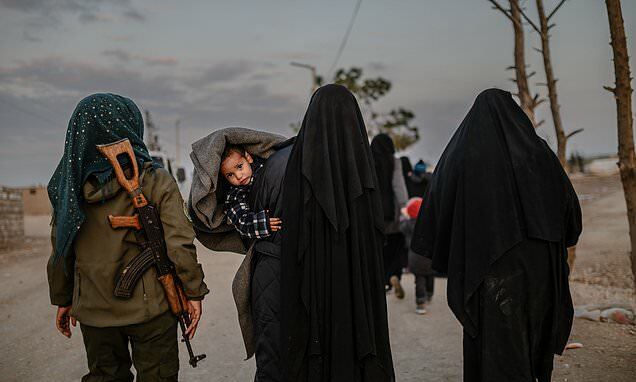 And the case of 19-year-old jihadi bride Shamima Begum, who has just given birth to a son in a refugee camp in Syria, illustrates this perfectly. No sooner is her case highlighted in the press than Home Secretary Sajid Javid starts trumpeting that those filled with hatred for Britain will be blocked from returning – only to be reminded by the head of MI6 and cooler heads that there is such a thing as international law. Whether a hardened jihadist or a victim of Islamic State indoctrination, Begum is British and cannot simply be rendered stateless by a Home Secretary in search of macho headlines. Culture Secretary Jeremy Wright rowed back on the threat to bar Begum’s return yesterday, promising instead that she will have to ‘answer for her actions’ if she comes home.